If there’s a central meeting place for the East and West, it just might be Singapore. I visited Singapore a couple times for work but managed to make sure I fit in some exploration, mostly during the evenings as you will see. I really didn’t know what to expect as I only had the stereotypical images in my mind: Strict rules and all about business. To cut to the chase, Singapore’s great for a short trip. From its modern, waterfront skyline to its character slash culture-rich local streets and alleys, you can get a pretty broad experience in a really small space. Singapore isn’t that big. A 30 minute Uber or taxi ride will get you to most places, yet you come across an easily visible range of architecture, languages and cultures. It does, after all, take up only about 2/3 the space that New York City does, but it has 4 official languages. What does a mix of cultures often mean? Good food. I’d also like to add that Singapore’s Cup Noodle flavors - chili crab and black pepper crab - are amazing. I cleared a 7-11 shelf before flying out, no joke. Singapore did turn out to be quite an international business hub, and I’d love for another trip there. After meeting with the Singapore Tourism Board and Singapore Art Museum staff though, I learned that they are making sincere efforts to show that they’re more than simply a business destination. One example of this is their Formula One race through the city. They also have Gardens by the Bay. Gardens by the Bay is a big nature park and visually, it’s impressive. 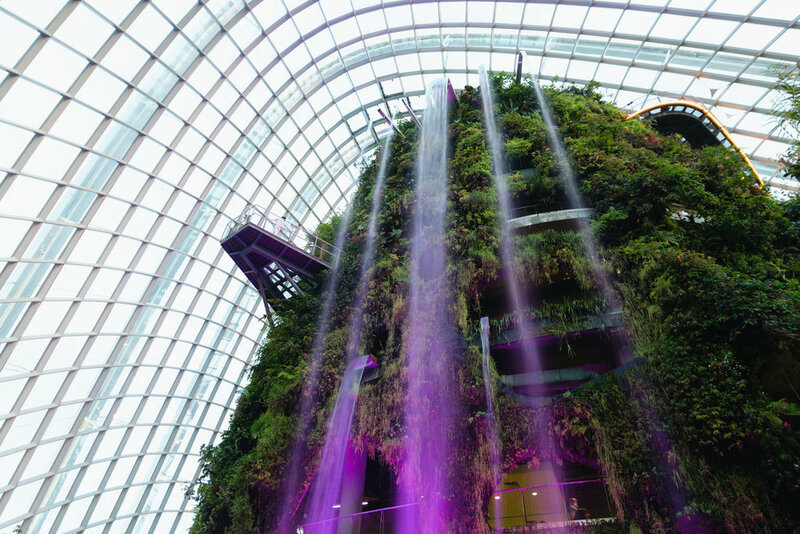 It features various different attractions but two of the most popular are the Flower Dome and Cloud Forest - atrium-like enclosures that when you walk through, it feels like you’re being transported to another land. Their Supertree Grove is another popular sight. More than a colorfully illuminated installation that sometimes does light shows, it also harvests solar energy and is used as part of the ventilation system of this environmentally friendly park. One thing noticeable in Singapore is how photogenic its buildings are, and not just in the Marina Bay area. A lot of the architecture, from business towers to public housing, is symmetrical with leading lines, contrasting windows and halls, and splashes of color accents. In other parts of the city, buildings were painted in vibrant color combinations and ethnic patterns. As someone who enjoys urban photography, it’s an amazing place to wander and take snapshots of and I only wish I had more time to do just that. Here’s to hoping I’ll be visiting sometime again. Singapore has a lot of nice restaurants and bars, and being the international place that it is, some of them reminded me of places you'd find in cities like Los Angeles. But if I'm lucky enough to make it back to Singapore again, these would be at the top of my list. While the difference was ever so slight compared to places like Palm Beach Seafood, I found Jumbo's chili crab to be my favorite. It had a nice balance of spicy and sweet, and the sauce is great over their fried rice. Their black pepper crab had more of a flavor kick and was just as amazing. Every dish that we had was really tasty. The restaurant is quite big and with decent service. 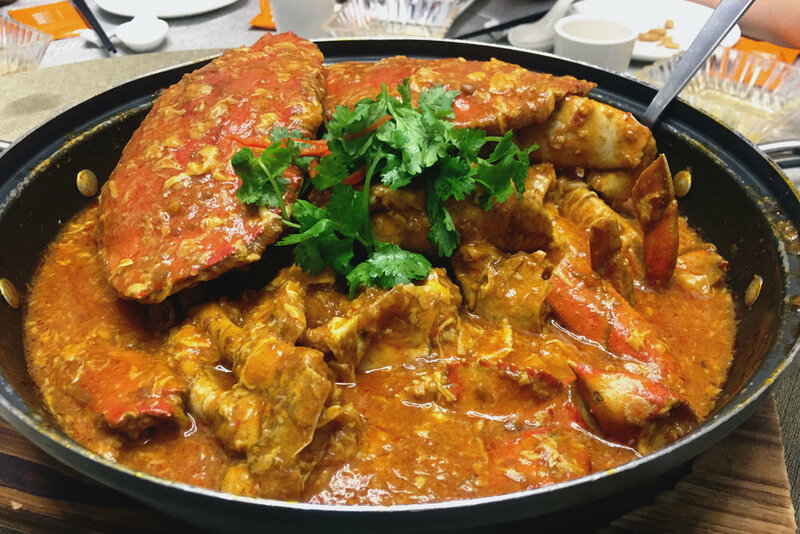 If you're in Singapore, chili crab is a must, and you can't go wrong with Jumbo. A fantastic recommendation by our Airbnb host, "Tangoh." This street-side, open-air eatery is extremely causal but wow, their prawn noodles were amazing and blew away my expectations. 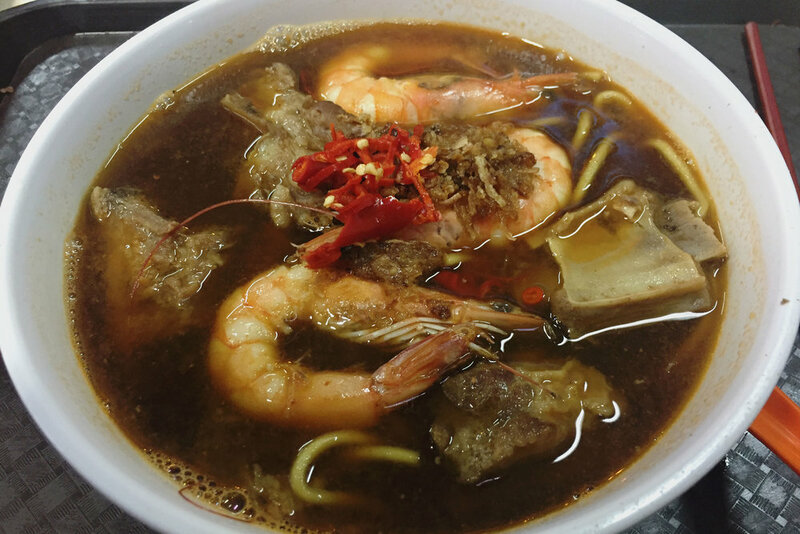 Their broth, made from boiling pig tail and prawn soup stock for several hours, results in a spicy, flavorful punch to the tastebuds. It may not be the most photogenic dish, but boy does its taste make up for it.